Tony, Bobby, Charles, Ed, and Eldon are on their way home after a great week of work repairing and updating the Lord’s Servants Home facilities and fellowshipping with the children, High Schoolers, Churches, and ministry workers and partners associated. They thought we sent the message with a bigger list that they could get done…Ha, they knocked it out. It has been nearly two years before substantial work was done on the facility. Here is Tony’s last work day update…. It has been another good day. We have mostly just tried to make sure all the jobs we started are complete. Bobby spent the day working with Ronnie the electrician to clean up more random electrical issues. There are so many small problems around that this is a never ending task. Bobby wired the new well switch we bought to accept a generator but the generator we have appears to be a little underpowered. I spent a good bit of the day in Kitale getting supplies and getting the small generator repaired. I also put a metal cover on the well pump box and just helped out with a few other things. Dad built several benches for the kids and they were working hard to get them sanded smooth so they can use them in the school. He also finished up repairing a cabinet for one of the teachers and made a few boxes to store our tools in. Ed worked with Ken to monitor and adjust chlorine levels in the water so as to make sure the water is as healthy as possible for the kids. Charlie and Ed both spent time securing pipes and replacing faulty faucets and other plumbing issues. 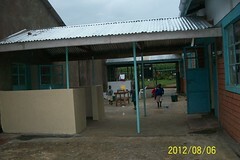 Pastor Ken did cement work around the compound in several areas that needed work. Tomorrow we plan on using a new generator to insure back-up power for the water well pump and meeting with pastors and leaders here. We will do clean up and rest a little in preparation for the long ride home.